Google Analytics has started beta testing a new feature called Google Signals, which offers cross-device reporting and remarketing capabilities. 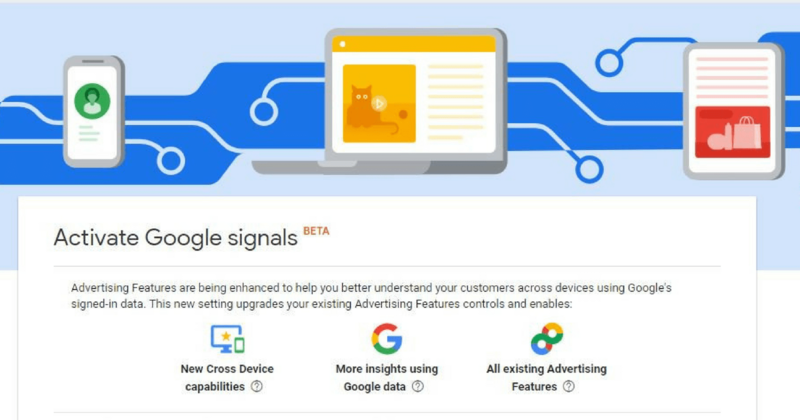 Users who choose to activate Google Signals can take advantage of new advertising features that are being enhanced to better understand customers across devices. Remarketing with Google Analytics: Serve ads in Cross Device-eligible remarketing campaigns to Google users who have turned on Ads Personalization. Advertising Reporting Features: Google Analytics will collect additional information about users who have turned on Ads Personalization. Demographics and Interests reports: Google Analytics will collect additional information about users who have turned on Ads Personalization. Cross-Device reports (in beta): Based on aggregated data from users who have turned on Ads Personalization, Google Analytics models behavior for a whole user base across device types. In a help document, Google explains why Google Signals is dependent on data from users who have turned on Ads Personalization. Activating Google Signals is necessary for reporting on cross-device user journeys, as well as remarketing to signed-in Google users. Sign in to Google Analytics. Click “GET STARTED” in the blue notification banner at the top of the page, or navigate to Property column > Tracking info > Data Collection and follow the prompt in the blue dialog. Click through the information and activation panels. The option to activate Google Signals will be rolling out to all users in the coming weeks. Some are already seeing it now. So if you don’t see it now, you will soon.